A professional Camera Hatch installation by GOMOLZIG is a well running must-have for aerial survey operations. 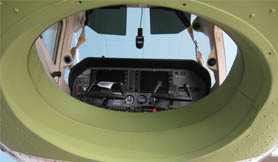 Our Camera Hatch Modofications don't weaken the aircrafts structure. The opposite is true. After an installation of GOMOLZIG Camera Hatch Kits, the aircraft structural strenght properties are significant increased without panalizing the aircraft's original weight limits. GOMOLZIG installs and certifies a large number of equipment operations. From aerial survey devices up to customized cabin layouts GOMOLZIG provides change approvals, documentations and support. With the increased requirements for more airborne observation missions, aerial photography, scanning, surveillance, border patrol and search and rescue, aircraft need to adapt to changing roles. GOMOLZIG has the experience having modified many aircraft types with a range of hatches, doors, windows and task specialised equipment racks and stowage’s. Camera Hatches can be supplied as a kit to be shipped to most Countries for fitment at an approved maintenance facility.